When thinking of invertebrates, my mind comes up with nasty things like beetles or spiders, or pretty things like butterflies. But, coral is also an invertebrate. It is not a plant, as many might assume. They are related to jellyfish and sea anemones. I did not know that. (currency for Antigua & Barbuda and also Dominica, St Vincent & The Grenadines, St Kitts & Nevis, St Lucia, Grenada, Anguilla & Montserrat). Coral reefs account for less than 1% of the planet's marine ecosystem while supporting nearly 25% of ocean life. A coral group is a colony of many thousands of nearly identical polyps and each polyp is a sac-like animal that is only a few centimetres long. They form when these polyps attach themselves to a rock or the sea floor. They then divide into thousands of clones. Each polyp excretes a calcium carbonate at their base which forms an exoskeleton where they attach themselves to each other and over several generations they form a larger skeleton or colony. Over hundreds and thousands of years, these colonies will join together to form a reef. Some reefs are known to be 50 millions years old. The polyps themselves are translucent and they get these brilliant hues from the algae they host. They are carnivores and feed on zooplankton and small fish. Great stamps. 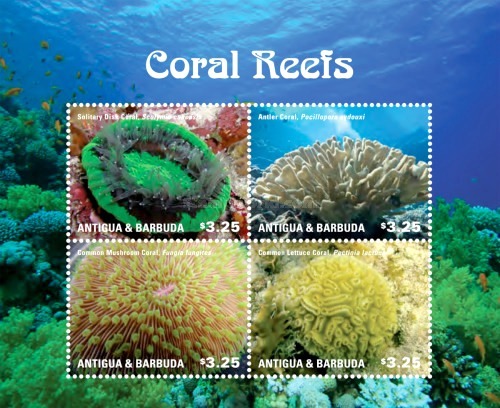 I think I knew that coral was an animal, however I would never have thought of it for this week's Sunday Stamps. Beautiful stamps of amazing animals! As did FinnBadger, also I hadn't thought of them for this Sunday;s theme. Thank you for sharing! Hello, the stamps are beautiful. The coral reefs are amazing. Happy Monday, enjoy your new week! I wou;d never have considered coral as an invertebrate. These are great stamps.